A game that looks like an RPG but plays like a time management puzzle. That's what you're in for if you pick up Half Minute Hero. I feel as if I'm on the verge of starting Final Fantasy VIII. I've had a good break since finishing FFVII, but I'm still playing around with other games in the meantime. Half Minute Hero has been one of them. Despite that title image up there, this is actually a pixel-fest when it comes to graphics. It has an old-school RPG charm to it that initially drew me in. 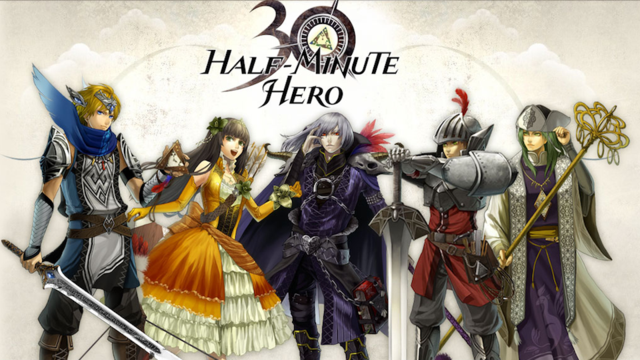 The best part of Half Minute Hero is the premise behind the game. You have 30 seconds to save the world. Your character always starts at level 1 and levels up by defeating enemies. There are ways to reset the clock while keeping your progress, but even so, one round of the game typically lasts less than 5 minutes. Every level is like playing one bite sized RPG. I picked it up on sale via PSN, but I know this game is out on most platforms. It's an older game too, so it tends to be cheap. Take a look at it if you're a RPG or puzzle game fan.